Kirito takes a bath at a church. Bath scene of Bercouli in the 90th Floor of Central Cethedral. Asuna Yuuki takes a bath (again). 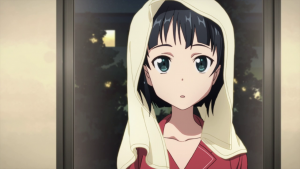 Suguha Kirigaya has an Off Screen Shower and then an Off Screen Bath later at night. She attempts to get Kirito to take a bath because he seemed really cold while he sat in his bedroom depressed. Suguha Kirigaya has a Furo session. There is possible Off Screen Shower scenes with Suguha Kirigaya and Shinozaki Rika because they are only wearing Towels. Asuna Yuuki takes a Bath while on her phone and gets out. Lisbeth and Asuna enjoy a open bath together, story published in Dengeki Bunko Magazine Volume 30. This page was last modified on 12 November 2018, at 11:40.